Solution Saddles Customer Stories: Solution Saddle Helped MS Sufferer To Feel Balanced & Symmetrical. Solution Saddle Helped MS Sufferer To Feel Balanced & Symmetrical. 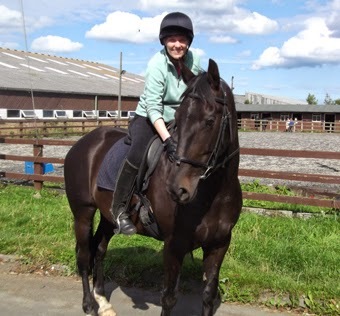 “Having been diagnosed with MS a year ago, tasks which were previously straightforward, such as buying a new horse and trotting, now present a challenge. Although I managed a reasonable trot when I tried my new horse, when I got him home things did not go so well. My instructor wasn’t happy for me to trot off the lunge as I was very unbalanced and had to hold onto a neck strap. We tried a few different saddles but none seemed to help my balance. When we heard of Solution Saddles RigidFree saddle range, we called to enquire about them. I had ridden another brand of treeless saddle before and found it uncomfortable and very wide so we arranged to have a saddle on trial so we could test it out thoroughly. I felt the difference immediately! I could trot, both rising and sitting, off the lunge, and without holding on. The change was huge. The saddle didn’t push me and move me away from the horse, instead I moved with the horse and I could feel the horses action more clearly. I felt balanced and symmetrical and was able to maintain my position without being jostled around. The saddle is very comfortable and doesn’t feel wide.